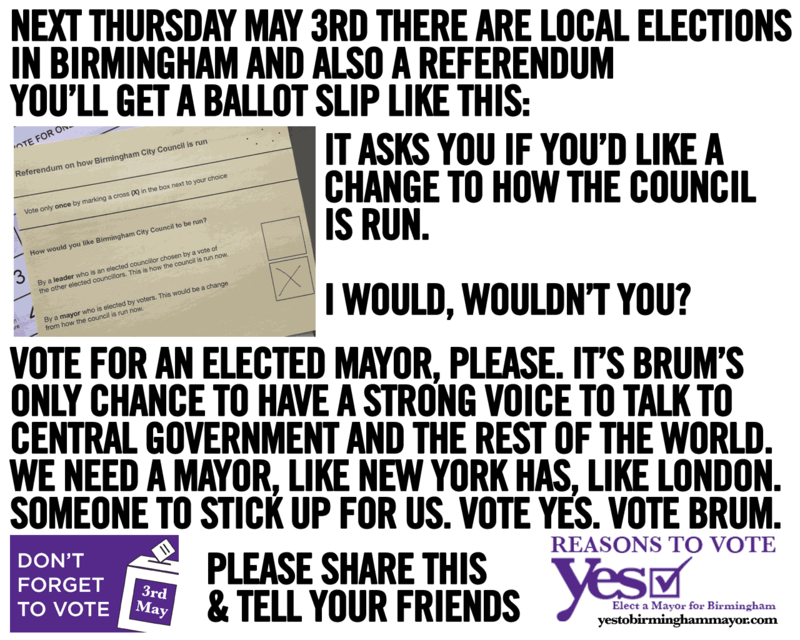 On Thursday, if you have a vote, there are local elections in Birmingham and also a referendum. You’ll get a ballot slip asking if you would like a change to how the council is run, if you’d like the opportunity to vote every four years for a directly elected mayor. I’ve been very convinced that we do need one and so please excuse this rare political message. Mayor of New York Mayor Bloomberg tells you why voting ‘yes’ in the referendum is a “total no-brainer”. 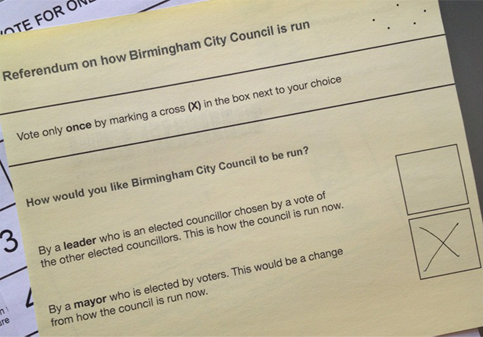 Tory/Lib Dem failure to publish manifestos for Brum elections treats voters with contempt. Also, makes powerful case for elected mayor. Do some people oppose #BrumMayor because they do quite well out of the current party political carve up? Do you think? And here’s why I’m voting yes. Even the biggest dog in the World thinks it’s a good idea. See the Yes to a Mayor Website for more reasons. Get a Twibbon for your Twitter pic or Facebook Profile. Join the Facebook Page or follow the Twitter account. er the William Bell video in favour of an elected mayor is refering to Birmingham Alabama? The video of Michael Bloomberg was made especially to show at a UK ‘yes’ event. I don’t think there’s anything about William Bell here. I haven’t made up my mind yet. But these arguments aren’t any better than any of the No campaign. “the current council system is either not trying or not working on them” Manchester seems to be doing perfectly well with the current system, so is the problem who we’ve elected, not the system they’re in? “it only seems to be politicians that are doing okay out of the current system that are saying ‘no’.” I know of plenty of nos who aren’t politicians. And who are the candidates for mayor if we say yes? Current system politicians like Sion Simon, Mike Whitby, Liam Byrne, … http://www.birminghampost.net/news/politics-news/2012/04/05/birmingham-mayoral-candidate-liam-byrne-admits-i-need-to-put-my-money-where-my-mouth-is-65233-30696865/ “Sir Albert dropped out of the race in return for the promise of a position as deputy mayor” – so really, where’s the change? The change is the accountability, the mandate. The fact that whoever you vote for they will have to say what they will do and then you can judge them on that. That’ll be why Stoke has voted to get rid of its mayor after six years, and Doncaster is voting on whether to remove theirs, then. They haven’t even announced what powers a mayor will have, you are basically saying vote for something over which you have no information as to what accountability or mandate they will have. An elected mayor will have an mandate of being elected by the majority of the six hundred and fifty thousand voters in Birmingham, rather than the 20-30 councillors that currently decide. A vote for A mayor is one step, then we must vote for the RIGHT mayor and hold them to account. I’m still undecided and will be voting in 10 hours time. In theory a mayor could be good for the city but there is the possibility of a useless fool getting the job. I’m also unsure of how many candidates there will be… ie from labour will Liam Byrne, Sion Simon and Gisela Stuart all stand or will one of them be chosen beforehand by Labour party members only (I think I read this is what will happen)?. Sion Simon appears to have been campaigning for the last year or so but in the last few weeks Liam Byrne has popped up, supported by Albert Bore which suggests he is not keen on Sion Simon as mayor? We could end up with Mike Whitby as mayor, heaven help us. There may be any number of candidates. It’ll be up to us all to decide what their manifestos represent and if we trust them to deliver them. But at least we’ll get that choice. So there could be three labour candidates, one tory, one respect, a tv news reporter and the one with the most votes wins? Labour will only field one candidate. There could be any number, as anyone is allowed to stand-Leicester had 12 candidates. There is a second preference system on the November ballot, if no-one gets 50% outright then second preferences are taken into consideration. None of this matters if we don’t vote ‘yes’. 2/3 of councillors having to vote against to overturn one person’s decision sounds steep to me, when the current process is a simple majority. (As it is in Parliament? Can you imagine a bill being allowed to pass on 1/3 support?) ) I dislike the fact that we don’t know what powers a mayor would actually have, and that there is no “vote of no confidence” process to remove them as there currently is for council leaders. Not to say that the current council do a brilliant job (I’m not really informed enough to judge) but could they do a better job if they were better councillors, without actually changing the governance processes? I do like the idea that the mayor could be of a different party to the council majority but worry this would rely on personality rather than policies. I agree that there has been very little campaigning for the Yes vote (and not that much for the No vote either, although we’ve just had a leaflet yesterday) and it is interesting to wonder why this might be. Aren’t we all cynical!! Anyway it’s nice to stumble across some actual debate on the subject, as there’s not been much information and it’s made me do a little bit more reasearch before voting. How will you hold them to account? You can have a vote of no confidence in the current system, can you do the same with a directly elected mayor? We can’t have a vote of no confidence in the current system.